Some may only just be waking up while others are returning from a walk in the beautiful gardens of the Château or an invigorating jog along the bridle paths of the nearby forest, but this is the time to get together for a truly satisfying and enjoyable Sunday brunch in the magnificent rooms of the restaurant of the Château d'Ermenonville. 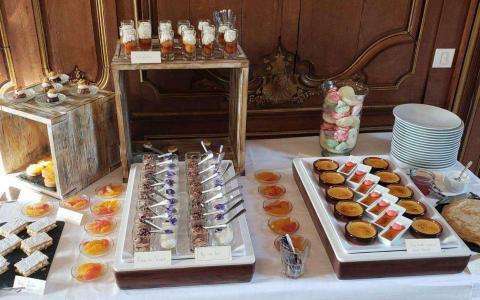 Faithful to the spirit of brunch, the Château d'Ermenonville offers savoury and sweet dishes to appeal to all tastes. Those who prefer a breakfast-style brunch will find assorted pastries and hot drinks, while those who have worked up a hearty appetite will opt for hot or cold savoury dishes that vary in accordance with the chef's inspiration. A wealth of fine flavours beautifully presented, the brunch of the Château is a delightfully delicious experience.